As Amita Health expands its reach under a big new merger, the health system plans to move its headquarters from Arlington Heights to Lisle. Amita has reached a tentative agreement to lease 225,000 square feet in the Navistar campus in west suburban Lisle, where it would move about 1,100 employees from seven suburban locations, including Arlington Heights. If Amita finalizes a deal with the truck maker, it would be the biggest office lease in the Chicago suburbs in more than a year. As it plots its headquarters move, Amita is poised for some other big changes due to another deal announced this week. Amita, a two-year-old joint venture between Ascension and Adventist Midwest Health, could more than double in size as result of Ascension’s planned acquisitionof Presence Health. Amita’s move would represent a major triumph for Lisle, bringing more office workers to its restaurants and more business to its hotels. “It’s going to bring a lot of people working in the community that are going to spend money in the community, so to me, it seems like a big win for the village,” Lisle trustee Anthony Carballo said during a discussion of the deal at an Aug. 21 village board meeting, according to a recorded video. Navistar has shrunk so much that its corporate offices at Interstate 88 and Naperville Road are awash in space. The company employs about 1,800 people there now, down from 3,200 when it moved there in 2011. 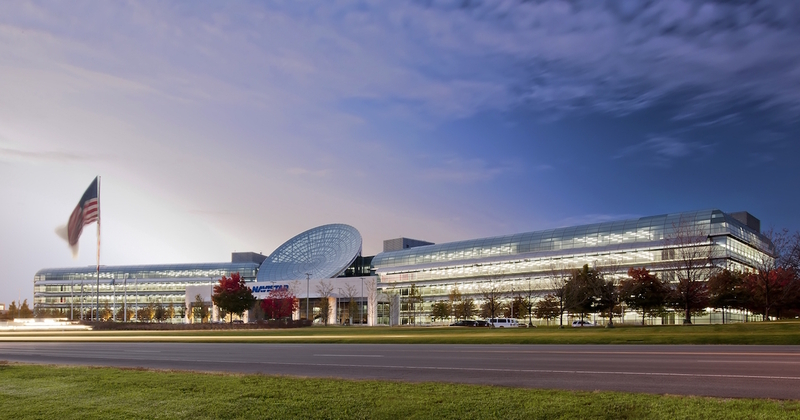 In late 2015, Navistar hired Jones Lang LaSalle to find one or more tenants to lease half the space in the 1.2-million-square-foot campus. So far, JLL has found one: National Express, a transportation firm that signed a 54,000-square-foot lease in a building at 2601 Navistar Drive earlier this year. A Navistar executive and JLL broker outlined the Amita deal in the Aug. 21 meeting because Navistar is seeking the village’s permission to expand a surface parking lot on its campus. Amita wants 5 parking spaces per every 1,000 square feet; Navistar currently can provide only 4.25, so it needs to add 176 spaces to accommodate Amita. Navistar would add the spots by making them narrower and removing some landscaping. The company was asking the village for a quick response, because Amita wants some assurance that the city will sign off on the change by the end of the month, when it faces a key lease deadline on another property, JLL Managing Director John Musgjerd told the trustees. Some trustees questioned Navistar’s request to fast-track the parking change, saying they were caught off-guard by it. But in the end, the board voted to direct village staff to draft a measure that would allow for expanded parking, to be taken up by the board at its Sept 11 meeting. That was enough to satisfy Musgjerd and presumably keep the deal alive. Reached by phone, Musgjerd declined to comment, as did an Amita spokesman. A Navistar spokeswoman did not respond to a request for comment. Under a 10-year-lease with Navistar, Amita would move office employees to Lisle from Arlington Heights, Bolingbrook, Hoffman Estates, Elk Grove Village and other suburban locations. It would start moving there next March, ultimately occupying three buildings on the north end of the Navistar property, Musgjerd told the Lisle trustees. “The only reason for this office is lease is their desire to get all their people under one roof,” Musgjerd said. It’s unclear if the headquarters lease has anything to do with the pending Presence merger. Amita operates six acute-care hospitals and three specialty hospitals in the Chicago. The deal with Chicago-based Presence would bring 10 more hospitals under the Amita umbrella. The deal with Navistar, meanwhile, is good news for landlords in the west suburban office market. Though the second-quarter vacancy rate for the far western suburbs, 19.8 percent, was below the overall suburban rate of 20.6 percent, according to JLL, the market has several big blocks of empty space. Big vacancies include the entire former OfficeMax headquarters, a 354,000-square-foot building along I-88 in Naperville; ConAgra’s former offices, an 189,000-square-foot building in Naperville, and an empty 206,000-square-foot building just east of Navistar’s headquarters. We DEFINE our success by how we DESIGN our success. And DuPage County is designed for prosperity. The 2016 Annual Report is a blueprint of the DuPage Advantage’s architecture. It reminds us that everything we do is deliberately designed for the people, the place, and the Prosperity of DuPage County.